The Chesapeake - CNOOC joint venture announced in October 2010 brought the Chinese into one of America's hottest plays. CNOOC paid Chesapeake $2.16 billion or $10,800 per acre for a 33% interest in 600,000 net acres at the time of the deal. CNOOC also has an option to participate with a 33.3% share in additional acreage and the development of midstream infrastructure with Chesapeake. Chesapeake and CNOOC target the Eagle Ford Shale play's oil window at depths of 5,000-11,000 ft with horizontal wells that have an additional 5,000-8,000 ft average lateral length. The company's stock is traded on the NYSE under the symbol CHK. Chesapeake's headquarters is in Oklahoma City, OK. In South Texas, Chesapeake has field offices in Carrizo Springs, San Antonio, Victoria, and Zapata. Chesapeake Energy develops onshore U.S. natural gas and oil reserves in the Barnett Shale (North Texas), Bossier (Louisiana), Eagle Ford Shale and Pearsall Shale (South Texas), Haynesville Shale (East Texas and Louisiana), Marcellus Shale (Appalachian Region of Ohio, Pennsylvania, and West Virginia), and Niobrara Shale (Colorado and Wyoming). Eagle Ford net production averaged approximately 97 thousand barrels of oil equivalent (mboe) per day (210 gross operated mboe per day) during the 2015 fourth quarter, a decrease of 10% sequentially. Production during the 2015 fourth quarter was impacted by plant downtime that averaged 2 mboe per day. Average completed well costs to date in 2015 (through October) are $5.4 million with an average completed lateral length of 6,250 feet and 23 frac stages, compared to the full-year 2014 average completed well cost of $5.9 million with an average completed lateral length of 5,850 feet and 18 frac stages. The company placed 18 wells on production during the 2015 fourth quarter, compared to 123 wells in the 2014 fourth quarter, and plans to place approximately 170 to 180 wells on production in 2016. Chesapeake's operated rig count in the Eagle Ford averaged three rigs in the 2015 fourth quarter, and the company anticipates releasing all operated rigs in the area by June. Chesapeake reported a net loss of $4.695 billion in the third quarter in contrast to a 3% year over year production increase. The company highlighted their focus on organizational and operational initiatives to face the extended low commodity price environment. Average completed well costs to date in 2015 are $5.3 million, compared to $5.9 million for 2014. Averaged three rigs in the 2015 third quarter, and the company anticipates maintaining three operated rigs through the end of the year. Chesapeake Energy Corp reported second quarter results amidst speculation about the viability and future of the company. Like many other shale drillers over the past year, Chesapeake is struggling. Prolonged crude prices and legal trouble are taking its toll and for the second straight quarter the company is reporting a huge net loss. For Q2, the loss is $4.151 billion. Operated rig count in the Eagle Ford averaged six rigs in the 2015 second quarter, down from 20 a year ago, and the company anticipates maintaining three operated rigs for the second half of the year. For first quarter of 2015, Chesapeake Energy announced a net loss of $3.8 billion and boasting of new technological innovations. Chesapeake’s loss is even more staggering when compared to the company’s net income of $374 million one year ago. The company plans to slash drilling and completions over the rest of the year. They expects to complete fewer than 50 wells in the fourth quarter of 2015 and will drop their rig count from 40 down to about 15. Chesapeake's Eagle Ford net production averaged ~88,000 boe/d (187,000 gross operated boe/d) during the first quarter of 2014. First quarter production was adversely impacted by temporary downtime at gas gathering and processing facilities, operated and competitor offset activity-related shut-ins and weather-related activity reductions. Company officials say these issues have lessened during April and May, and Chesapeake is projecting a higher sequential quarterly growth trajectory for Eagle Ford production during the remainder of the year. Approximately 64% of the company’s Eagle Ford production in the 2014 first quarter was oil, 15% was NGL and 21% was natural gas. Chesapeake operated an average of 18 rigs and connected 81 gross wells to sales during the first quarter of 2014 in the play, compared to 12 average operated rigs and 65 gross wells connected to sales during the fourth quarter of 2013. 81 wells were put online in the Eagle Ford during the first quarter of 2014 - average production was approximately 885 boe/d from these wells. As of March 31, 2014, Chesapeake had 945 producing wells and 114 wells awaiting pipeline connection or in various stages of completion in the Eagle Ford. In the Eagle Ford Shale play, Chesapeake connected 140 wells to sales during the 2013 second quarter, which was substantially more than the 111 wells connected during the 2013 first quarter. Net production during the 2013 second quarter averaged approximately 85,000 boe/d (190,000 gross operated boe/d). This represents an increase of 135% year over year and 14% sequentially. The average peak daily production rate of the 140 wells that commenced first production during the 2013 second quarter was approximately 900 boe/dy. Approximately 66% of the company’s Eagle Ford production during the 2013 second quarter was oil, 14% was NGL and 20% was natural gas. Chesapeake is currently operating 15 rigs in the Eagle Ford and, due to reduced cycle times and the sale discussed above, plans to reduce its operated rig count to 10 by the end of 2013. Average spud-to-spud cycle time during the quarter was 16 days, down from 21 days year over year. As of June 30, 2013, Chesapeake had drilled a total of 963 wells in the Eagle Ford, which included 795 producing wells, 24 additional wells waiting on pipeline connection and 144 wells in various stages of completion. Chesapeake continues to generate strong liquids production growth rates from its Eagle Ford Shale play in South Texas. Net production during the 2013 first quarter averaged 75,000 boe/d (166,000 gross operated boe/d). This represents an increase of 225% year over year and 20% sequentially. Approximately 65% of the company’s Eagle Ford production during the 2013 first quarter was oil, 18% was NGL and 17% was natural gas. As of March 31, 2013, Chesapeake had drilled a total of 887 wells in the Eagle Ford, which included 650 producing wells, 34 additional wells waiting on pipeline connection and 203 wells in various stages of completion. The company is currently operating 15 rigs in the play and plans to reduce its operated rig count to 13 rigs in the second half of 2013. Spud-to-spud cycle times during the quarter were 18 days, down from 25 days year over year. 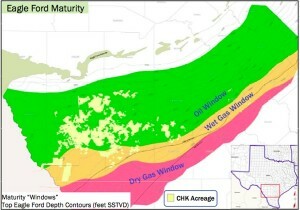 Chesapeake plans to have substantially all of its core Eagle Ford acreage held by production by the end of 2013. The average peak daily production rate of the 111 wells that commenced first production during the 2013 first quarter was approximately 950 boe/d. Chesapeake is in the process of selling a portion of its northern Eagle Ford Shale leasehold and producing assets which are outside of its core development area. Chesapeake continues to generate impressive liquids production growth rates from its 485,000 net acres of leasehold in the Eagle Ford Shale in South Texas. Net production during the 2012 fourth quarter averaged 62,500 boe/d (143,200 gross operated boe/d). This represents an increase of 266% year over year and 20% sequentially. Approximately 66% of total Eagle Ford production during the 2012 fourth quarter was oil, 15% was NGL and 19% was natural gas. As of December 31, 2012, Chesapeake had 534 gross operated producing wells in the Eagle Ford, of which 405 reached first production in 2012, including 98 in the fourth quarter. The company is currently operating 17 rigs in the play, down from a peak of 34 rigs in April 2012, and plans to operate an average of 16 rigs in 2013. Spud-to-spud cycle times have declined dramatically in the Eagle Ford, from 26 days in the 2011 fourth quarter to only 18 days in the 2012 fourth quarter. Chesapeake plans to drill fewer Eagle Ford wells in 2013 than in 2012; however, the planned number of wells turned-to-sales will be roughly equal in both years. The company remains on pace to have substantially all of its core and Tier 1 Eagle Ford acreage held by production by the end of 2013. Of the 98 wells that commenced first production in the 2012 fourth quarter, 90 wells (or 92%) had peak production rates of more than 500 boe/d, including 27 wells (or 28%) with peak rates of more than 1,000 boe/d. The Shining Star Ranch B 1H in La Salle County, TX achieved a peak rate of approximately 1,580 boe per day, consisting of 1,450 bbls of oil, 80 bbls of NGL and 0.3 mmcf of natural gas per day. As part of its “core of the core” strategy, Chesapeake is currently pursuing the sale of a portion of its existing leasehold and producing assets outside its current core development area in the Eagle Ford play. The Foley MCM A 1H in McMullen County, TX achieved a peak rate of approximately 1,500 boe per day, consisting of 1,335 bbls of oil, 55 bbls of NGL and 0.6 mmcf of natural gas per day. Total net production, from the Eagle Ford, averaged over 17,700 BOE per day in Q4 2011. That's up 60% versus Q3 and 370% year-over-year. Our current gross operated production from the play is 45,500 boe/d and 22,600 boe/d on a net basis. Our production mix in this play is approximately 50% crude, 20% NGLs and 30% natural gas. We continue to be very pleased by our performance in the Eagle Ford, and it's a driving force behind our liquids production growth targets in the months and years ahead. To date, we have 108 wells that tested with peak oil rates of 500 b/d or more. And that's not an equivalent basis, that's black oil in the tanks. We are producing 178 wells in the play to date and have a backlog of almost 200 additional wells to be completed and connected in the coming months. This will fuel our production ramp-up through the end of the year and into '13. We finished 2011 with 7 frac crews running in the Eagle Ford and will be up to 11 by mid-March of this year and 13 by the end of 2012. We've also doubled our drilling efficiency in the play since January 2010 based upon drilling feet per day to now approximately 725 feet per day. And this has driven down our days/well and helped reduce costs. And great progress has been made in building and restructuring the play with the addition of 350 miles of pipeline during the year. We expect to gain greater transportation capacity as 80 more miles of pipeline and regional rail and loading terminals are put in. And we also are adding 85 oil hauling trucks from Chesapeake's very own trucking company within Thunder Oilfield Services. These actions help ensure that our oil moves to markets that give us the highest oil price possible. Chesapeake has four plays that resulte in more than 900 mmboe back to the company. "They would be the Eagle Ford, where we own 460,000 net acres; the Mississippi Lime play in Northern Oklahoma and Southern Kansas, where we own 1.4 million net acres; the Cleveland Tonkawa play in the Anadarko Basin, where we own 750,000 net acres; and now the Utica, where we own 1.35 million net acres after our JV sale. Collectively, the potential of these plays, net to Chesapeake shareholders, is over 4.3 billion barrels of oil equivalent. And by the way, our net leasehold cost in those plays is now only $100 per net acre. For example, in the Eagle Ford, we've only lately have had kind of a surge of production there because we were waiting on a lot of infrastructure. We just, I think, did a pretty good job of modeling for that. And you don't see us miss our numbers and then blame unforeseen circumstances. We plan for those and take it in stride. And, again, through our balanced and diversified asset base, we can have issues in one area and not affect our overall performance." Press Release July 29, 2011 "...Yes, I think when you look at the Eagle Ford, you see the best rates of return in the wet gas window. It's got a lot of energy and got a lot of hydrocarbon stuck -- stacked into place." "Eagle Ford Shale. First Chesapeake production was in 2010. Our current gross operated production is 20,000 barrels of oil equivalent, making us the fourth largest producer in the play to date..." Source: Chesapeake Energy Corporation Press Release May 3, 2011 "We still have -- and I'll let Steve jump in here too. But we have lots of logistics issues in the Eagle Ford where we are limited by the amount of oil that we can produce. And so we have a whole lot of oil shut in, and maybe Steve has more." "And there is a lot of bottlenecks associated with trucking, part of it was also completion prohibitions during the dear hunting season over the winter. And so we were able to get some oils drilled but a lot didn't get completed until the spring. So we should have a very good quarter in the second quarter."